ST. GEORGE – A 50-year-old man was arrested Wednesday for breaking into a pharmacy and then threatening a gas station clerk with a gun when the clerk wouldn’t allow him to borrow his jeep. While responding to a burglary in St. George, St. George Police officers discovered several windows broken on the outside and inside of the Professional Park Pharmacy building, located at 736 S. 900 East in St. George, along with several broken security wires, St. George Police Officer Joshua Wilson wrote in his probable cause statement supporting the arrest. Officers located a shattered glass door on the side of the building and determined it to be the point of entry, Wilson said in the statement. When officers entered the building, they discovered shattered glass in the door to a dentist office down the hall and a broken security wire. While Wilson was processing the scene, he was informed that a possible suspect had been detained at a nearby gas station, located at 795 E. 700 South. The suspect allegedly went into the gas station and asked the clerk if he could borrow his jeep, and the clerk refused. The suspect, identified as Kenneth Eric Ogden, of St. George, told officers he suffered from a particular mental disorder and had just gotten out of the hospital, Wilson said in the statement. Ogden told officers that he woke up on the grass and didn’t know where he was. Ogden admitted to breaking several windows and a door to gain entry into the pharmacy building, Wilson said, because he was looking for a phone to call his girlfriend. Ogden was arrested and charged with one first-degree felony for aggravated robbery, one second-degree felony for burglary and one third-degree felony for criminal mischief. 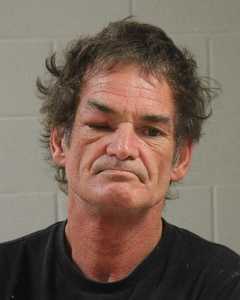 He was booked into the Washington County Purgatory Correctional Facility on Wednesday. His bail stands at $35,000. No reported confirmation of Ogden’s mental condition has been made as this report is published. Guns, prescription drugs and obnoxious. Doesn’t that describe a typical middle-aged male from Dixie? The only thing missing is a truck. Perhaps too much religious koolaid made him mentally ill. The guy thinks someone else is a jerk for Not agreeing to let him borrow their car ? What planet is this guy from ? He just wanted to call his girlfriend…….I’ll bet she’s a babe! Another fine upstanding Dixie citizen just wanted to make a difference in someone’s life. Needed the Jeep for a hot date that evening. He DOES suffer from mental instability and has so much going on. He is NOT a dangerous man. He DOES NOT own a gun. He happens to be my father. His mom died recently and she was his best friend. She was everything to him and he is now alone in Utah. He was in the hospital the night before for suicide attempt. He left a voicemail on my phone before this all happened telling me how sorry he was and that he cannot stand life the way it is. He went to the hospital to get HELP and he didn’t get the help he needed. I wish people would stop to think before they speak. He would never do anything like the above statement while in his rite state of mind. Please stop judging people when you have NO IDEA what their story is. Thanks.